Rupa-Goswami (1489–1564) was a devotional teacher (guru), poet, and philosopher of the Gaudiya Vaishnava tradition. With his brother Sanatana Goswami, he is considered the most senior of the six Goswamis of Vrindavan associated with Caitanya Mahaprabhu, a hidden avatar (incarnation) of Krishna in Kali Yuga. Rupa's lineage can be traced to Jessore, present Bangladesh. Rupa Goswami's nephew, Jiva Goswami has explained in his Laghu Tosani that Rupa's ancestors were of the Bharadvaja gotra (Rajshahi) from Kedarnath and used to live in Jessore. Alternatively, as mentioned in Sri Navadvip dham Parikrama by Srila Bhaktivedanta Narayana Gosvami Maharaja, Śrī Rūpa, Śrī Sanātana and their youngest brother Anupama who were Yajurvedīya Bhāradvāja Gotrīya brāhmaṇas, whose forefathers supposedly hailed from Karnāṭaka, South India. Śrī Sanātana Gosvāmī's previous name was Amara and Śrī Rūpa Gosvāmī's name was Santoṣa. Rupa Goswami spent his childhood in Jessore and later he sought a job with the Sultan Alauddin Hossain Shah at Gaur. He became a caretaker of the finance side of the Sultan. Sanatan joined his brother in the Sultans forces. At the advent of Sri Chaitanya Mahaprabhu in 1496, both of them fled from Hussain Shah's patronage and joined Chaitanya Mahaprabhu. Mukun son, Kumaradeva, moved to Jessore. 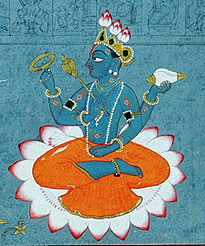 His sons were Rupa, Sanatana, and Vallabha (Anupama). The former names of Rupa and Sanatana are not known. They were Telugu speaking Brahmins from Telang Desh from the Bhatt clan. Some say that their original names were Santosha Bhatta and Amara Bhatta respectively. On the demise of Kumaradeva, the three sons moved to Sakurma, near to the capital of Gaudadesa (Bengal) where they continued their studies. They lived for the rest of their lives with their new monastic names and forsake their birth names. Due to their noble characters and academic proficiency, Rupa and his elder brother Sanatana were later forced into government service by the sultan of Bengal, Alauddin Husain Shah(1493–1519 CE) which led to their excommunication from Hindu society by the orthodox caste brahmanas of Gauda. Rupa became the Sultan's chief secretary (Dabir Khas), while Sanatana became the state revenue minister (Sakara Mallik). Rupa and his brothers made their residence at the state capital of Ramakeli ( Rahanpur, Nababganj ) and it was here, in 1514 CE, that they met Chaitanya Mahaprabhu for the first time. The meeting changed their lives and they decided to leave the service of the Sultan and take up a life of renunciation in the association of Chaitanya and his followers. Rupa (Amara's initiated name) loaded all his wealth onto two boats and left with his brother Anupama (Srivallabha's initiated name) for their ancestral home at Fatiabad in Jessore, where they distributed it. They then sent two messengers to Jagannath Temple (Misra's house) at the then Gaur, Sylhet to get news of Chaitanya Mahaprabhu's plans. The messengers returned with the news that Chaitanya had already left Sylhet for Barogharia, Nababganj. Rupa and Anupama immediately decided to go and they wrote a letter to Sanatana telling him of their plans and asking him to meet them in Nababgonj. They also told him that they had left 10,000 gold coins in case he was in need of financial help. Later, when Sanatana was thrown into prison by the Sultan for disobedience, he used this money to bribe the jailer and escaped to Varanasi to meet with Chaitanya Mahaprabhu. After visiting Vrindavana, Chaitanya stopped at the holy city of Prayaga (modern day Prayagaraj in Uttar Pradesh). It was here that Rupa and Anupama met him for the second time. At the Dasasvamedha Ghat (a famous bathing area on the banks of the River Ganges), Chaitanya imparted instructions to Rupa Goswami and explained all the intricacies of the doctrine of Gaudiya Vaishnavism. Rupa Goswami was specifically commanded by Chaitanya Mahaprabhu to carry out two tasks: to re-locate and preserve the lost holy places of Vrindavana, and to write and preach Gaudiya Vaisnava theology. He then sent Rupa Goswami to Vrindavana to carry out these orders. During the time of the annual Rath Yatra festival, Rupa Goswami composed one mystical verse that Chaitanya Mahaprabhu requested him to read to his most intimate associates. Upon hearing this verse, all the assembled Vaishnavas praised Rupa Goswami for his outstanding composition that was filled with deep devotion for the Naths. Due to this, it was proclaimed that Rupa Goswami was the very embodiment of Chaitanya' Mahaprabhu's esoteric teachings of rasa (divine mellows). Because of this, Rupa Goswami is considered by the gaudiya vaisnavas to be the foremost follower of Chaitanya Mahaprabhu and those that strictly follow in his preceptoral line are known as Rupanugas (followers of Rupa). In Gaudiya Vaishnava theology, Rupa Goswami is considered to be the incarnation of Rupa Manjari, the foremost junior cowherd damsel who eternally serves Radha-Krishna under the guidance of Lalita. Even though there are so many great acaryas, Srila Rupa Goswami has been attributed with the honour of being that person who has established the mano-'bhistam, the innermost heart's desire, of Sri Krsna in the form of Caitanya Mahaprabhu. When Sriman Mahaprabhu came to the village of Ramakeli-grama, He met with Srila Rupa Goswami and Srila Sanatana Goswami and told them, "You should leave your homes and be with Me." The ocean of the transcendental mellows of devotional service is so large that no one can estimate its length and breadth. However, just to help you taste it, I am describing one drop. Lord Caitanya gave one drop of the ocean of rasa to Srila Rupa Goswami, and that one drop was sufficient to inundate millions upon millions of universes. Later, He met with Srila Sanatana Goswami in Varanasi. After some time Srila Rupa Goswami and Srila Sanatana Goswami came here to Vrndavana and began to perform their bhajana, their hearing, chanting, and remembering Krsna. Rupa Goswami thought, "In order to fulfill the innermost heart's desire of Sri Caitanya Mahaprabhu I will write a drama. In this drama I will explain the beauty of the meeting pastimes of Srimati Radhika and Sri Krsna in Vrndavana, and also the separation pastimes, when Lord Krsna leaves Vrndavana and goes to Mathura and Dvaraka. I will explain how, by their expansions, Srimati Radhika and all the sakhis somehow or other went to Dvaraka and became Lord Krsna's 16,108 queens." He intended to write about this, but while he was travelling towards Jagannatha Puri he came to the village of Satyabhama-pura. There, Srimati Satyabhama-devi, Lord Krsna's chief queen, appeared to him in a dream and told him, "Please don't make this only one drama. Rather, divide it into two parts." Then, when Srila Rupa Goswami finally arrived at Jagannatha Puri and met with Sri Caitanya Mahaprabhu, the Lord confirmed what he had heard from Srimati Satyabhama in his dream. Sriman Mahaprabhu told him, "Don't take Lord Krsna out of Vrndavana." The Krsna known as Yadu-kumara is Vasudeva Krsna. He is different from the Krsna who is the son of Nanda Maharaja. Yadu-kumara Krsna manifests His pastimes in the cities of Mathura and Dvaraka, but Krsna the son of Nanda Maharaja never at any time leaves Vrndavana. "Krsna never leaves Vrndavana. He never even sets one foot outside of Vrndavana." Srila Rupa Goswami then divided his drama into two parts. The first part is called Vidagdha-madhava, Sri Krsna's pastimes in Vrndavana; and in the second part, called Lalita-madhava, He goes to Dvaraka and all the gopis of Vrndavna were reunited with Him in the form of the queens of Dvaraka. Why did Srila Rupa Goswami do this? The reason is a very deep siddhanta (conclusive philosophical truth). Srila Kavi Karnapura is a very great devotee and he composed Sri Ananda Vrndavana Campu. In this book he has described the pastimes of Lord Krsna from His birth up to rasa-lila and the Divine Couple's swing pastimes, and he stopped there. He didn't go any further than this. He didn't describe about Krsna going to Mathura or Dvaraka, because this separation mood is very difficult to tolerate for the pure devotees. He was thinking, "My Mistress Radhika cannot tolerate this separation, so I will not write about it." Srila Rupa Goswami, however, has written about the moods of both meeting and separation – because this separation mood is a very deep transcendental ecstatic feeling. At the time of meeting, though Radharani and Krsna are together, something may be forgotten or lost in the heart. On the other hand, at the time of separation, there is complete meeting in new and fresh ways in the heart; and not only inside, but sometimes externally there are sphurtis, temporary visions in which the loved one is actually present. Knowing all these very deep transcendental established truths, and wanting to establish the desire of Sri Caitanya Mahaprabhu within the world, Srila Rupa Goswami also glorified the mood of separation. Although this mood is very high and has many transcendental features that will not come at the time of meeting, still, it is not our goal of life. No Gaudiya Vaisnavas want Sri Sri Radha and Krsna to be eternally separated. What kind of person would want this? No Vrajavasi would want it. Rather, there is a place for this separation mood, and Srila Rupa Goswami has explained this in his book, Ujjvala Nilamani: "Na vina vipralambha sambhoga pusti masnute. Without the mood of separation, the mood of meeting will not be nourished and come to increasingly higher stages. The pastimes of separation are very important because they play the role of nourishing the sweetness of meeting." That very personality who stole away my heart during my youth is now again my master. These are the same moonlit nights of the month of Caitra. The same fragrance of malati flowers is there, and the same sweet breezes are blowing from the kadamba forest. In our intimate relationship, I am also the same lover, yet my mind is not happy here. I am eager to go back to that place on the bank of the Reva under the Vetasi tree. That is my desire. [Spoken by Srimati Radharani:] My dear friend, now I have met My very old and dear friend Krsna on this field of Kuruksetra. I am the same Radharani, and now We are meeting together. It is very pleasant, but still I would like to go to the bank of the Yamuna beneath the trees of the forest there. I wish to hear the vibration of His sweet flute playing the fifth note within that forest of Vrndavana. In this verse Srila Rupa Goswami has clarified Sri Caitanya Mahaprabhu's inner meaning and thus he revealed to the world the importance of parakiya-rasa, the mood of paramour love between Lord Krsna and the gopis. Srila Rupa Goswami is that very person who established within this world the innermost heart's desire of Sri Caitanya Mahaprabhu. After Sriman Mahaprabhu disappeared from the vision of the world, the discussion of parakiya-rasa was not prominent. According to scripture, mundane rasa, this world's love between those who are unmarried, is very immoral, illicit and sinful. However, in addition to manifesting the endless varieties and wonder of vipralambha and sambhoga, the meeting and separation pastimes of Radha and Krsna, Srila Rupa Goswami also established the superiority of parakiya-rasa. By using evidence from many different sastras, he proved that Lord Sri Krsna is not an ordinary nayaka (lover) and Radhika is not an ordinary nayika (beloved). In other words, when there is meeting between a mundane lover and beloved in the parakiya mood it is very sinful, but Sri Krsna is a transcendental personality, god Himself, and everything is possible for Him. Therefore, if He is the object of the parakiya-bhava, there is no fault or defect in this. Rather this is the topmost supremely pure manifestation of madhurya-prema, the romantic mood. May the Supreme Lord who is known as the son of Srimati Saci-devi be transcendentally situated in the innermost chambers of your heart. Resplendent with the radiance of molten gold, He has appeared in the Age of Kali by His causeless mercy to bestow what no incarnation has ever offered before: the most sublime and radiant mellow of devotional service, the mellow of conjugal love. I was born in the darkest ignorance, and my spiritual master opened my eyes with the torchlight of knowledge. I offer my respectful obeisances unto him. When will Srila Rupa Goswami Prabhupada, who has established within this material world the mission to fulfill the desire of Lord Caitanya, give me shelter under his lotus feet? These deliberations and philosophical conclusions are extremely deep, and very difficult to understand. It is therefore essential that one come under the guidance of a self-realized Guru and pure devotees, and give ones full-time and energy, very hard labour, and enthusiastic work in the service of that Guru and in chanting harinama, the holy names of Krsna, and doing bhajana. One should also make a great effort to understand and realise the reason for which Srila Rupa Goswami appeared in this world and why he wrote so many books like as Sri Bhakti-rasamrta-sindhu, Sri Ujjvala-nilamani, Sri Vidagdha-madhava and Sri Lalita-madhava. Unless one comes to the lotus feet of Sri Guru and makes a very great endeavour to understand these topics, after some time he will be taken away by maya and engage in mundane activities. This is a very important point. Bhakti-rasamrta-sindhu (The Ocean of Nectar of Divine Love): Bhakti-rasamarta-sindhu can be considered to be one of the most important books in Gaudiya Vaishnavism. It elaborately describes gradations of bhakti from its lowest stage of sraddha (faith) up to its highest stage of maha-bhava (ultimate ecstasy in love of Godhead). Ujjvala-nilamani (The Sapphire of Divine Love): This work exclusively explains the conception of madhurya-rasa (divine conjugal love). Ujjvala-nilamani is considered to be a sequel to the Bhakti-rasamrta-sindhu. Laghu-bhagavatamrta (A Summary of Nectar about Godhead): It is a summary of Sanatana Goswami's book Brhat-bhagavatamrta. It begins by explaining the intrinsic nature of Krishna and his incarnations and subsequently deals with devotees of Krishna. Vidagdhamadhava (1524) & Lalitamadhava (1529): Rupa originally began to write these two dramas as one in 1516 but he completed them as two separate plays in Vikram Samvat 1581 (1524) and Saka era 1451 (1529) respectively. It is said that Rupa had a vision of Satyabhama, one of Krishna's queens in Dvaraka, who told him to divide the book into two separate dramas. Thus, Lalitamadhava deals with Krishna's pastimes in Dvaraka, and Vidagdhamadhava narrates Krishna's pastimes in Vrindavana. Stavamala (The Flower Garland of Prayers): This is a compilation of short works, some of which are often published as separate books. Danakelikaumudi (The Lotus-like Tax-collecting Pastimes) (1549): This Bhāṇikā (one-act play) was written in Saka era 1471 (1549) and narrates the danakeli (tax-collecting pastime) between Krishna and the Gopis of Vrindavana. Sri Radha-krsna-ganoddesa-dipika (A Lamp to See the Associates of Radha-Krsna) (1550): In this book, Rupa Goswami lists the associates of Radha and Krishna and describes their characteristics. Mathura-mahatmya (The Glories of Mathura): This book tells the glories of Mathura, in the form of a conversation between Varaha (the boar incarnation of Vishnu) and the Earth Goddess. Rupa Goswami explains various processes of devotional service by quoting statements from various Hindu scriptures and establishes that Mathura vanquishes all one's sinful reactions and awards piety and liberation. Uddhava-sandesa (News of Uddhava): In this work, Rupa Goswami narrates the story from the Bhagavata Purana of Krishna requesting his friend Uddhava to go to Vrindavana and pacify his friends and relations by reminding them of their pastimes with him. Hamsa-dutam (The Swan Messenger): This text tells the story how Lalita, the confident of Radha, sends a messenger in the form of a swan to Krishna in Dwaraka. Sri Krsna-janma-tithi-vidhi: This short work is a paddhati (manual on ritual worship) explaining the process of worshiping the deity of Krishna during the festival of Janmastami, the birthday of Krishna celebrated by Vaishnavas in August/September. Nataka-candrika (The Illuminating Moon of Dramatics) This book explains the rules of Gaudiya Vaisnava dramaturgy. Upadesamrta (The Nectar of Instruction): This short work contains eleven verses of instructions to aspirants on the path of devotion to Krishna. The Upadesamrta was originally a part of the Stavamala. Mahayogi, Swami B.V., Lives of the Saints, translated from Gaura Parsada Caritavali, unpublished work. Gaudiya Vaisnava Abhidhana (Bengali), Compiled by Haridasa Dasa, Haribol Kutir, Navadvipa, W. Bengal, 1957. This page was last edited on 30 March 2019, at 23:01 (UTC).